There is no doubt that the church with this dedication and location was built in 1903 as a chapel in the parish of Christ Church, Seaside and became a parish church in 1925 (1). The foundation stone named C E Powell as architect. However, there is a reference to an earlier church in Eastbourne with the same dedication, intended as a fisherman’s church, which was announced in 1885 (BN 48 p764) and was said to be designed by A W M Mowbray. The announcement went into some detail, stating that it was to be of yellow brick and that strict economy was to be applied, but it must be doubted whether it was ever built. No further reference has yet come to light and neither Brown nor Elleray mentions it; by reason of the date alone it cannot be this church. Powell’s plain but substantial brick church cost £6800 (1) and had five stepped west lancets. It was unfinished for lack of funds, as the temporary narrow aisles showed. Their grouped oblong windows, similar to those in the clerestory, would have been re-used when the aisles were extended to their full width on a line with the vestry (ibid). No tower was planned and a flèche over the chancel arch was never built. The interior had long but relatively low arcades with two bays east of the tall chancel arch. Powell remodelled the small south chapel shortly before he died (CDG June 1932 p220). Subsequent changes included a new hall, linked to the church at the north west corner by a porch. Despite repairs by J L Denman and Son in 1956-59, structural problems and the excessive size of the church led to its demolition in 2004 and much of the site was sold for housing. 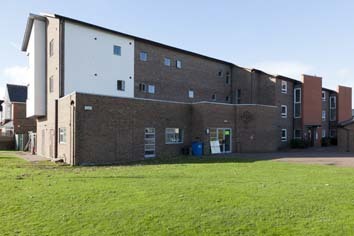 Plans for a new, smaller church have not been realised and the congregation uses a hall incorporated in the ground floor of the flats built on the site in 2006. The purpose of this is revealed only by the cross beside the entrance. The parish has been reunited with Christ Church since 2009. Cross: (Above the altar) formerly over Powell’s grave at Arlington (1). Glass: 1. (East window) H G Murray, 1921 (ibid). 2. (South chapel throughout) E A Woore, 1936 (ibid). War memorial: Tablet, 1920s attributed to W Glasby (D Green and D and J Hadley p122).